If you have ever wondered which fly to choose beyond pure guess work then this book was written for you. 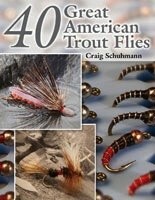 The forty flies included are a core set of flies that can be used anywhere to catch fish. Most of them are well known, even to the novice. Prince Nymph, Copper John, Pheasant Tail Nymph, Elk Hair Caddis, Stimulator, nymphs, dries, streamers, wets and soft hackles, midges and emergers, terrestrials, and more. All color photos, 8.5x11 inches, 88 pgs.